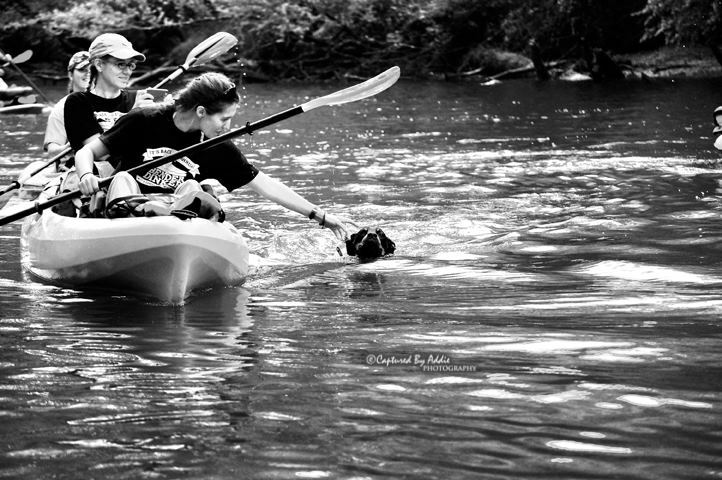 This last Saturday, I went kayaking with my friends, Cassandra, Darren, and Dani. 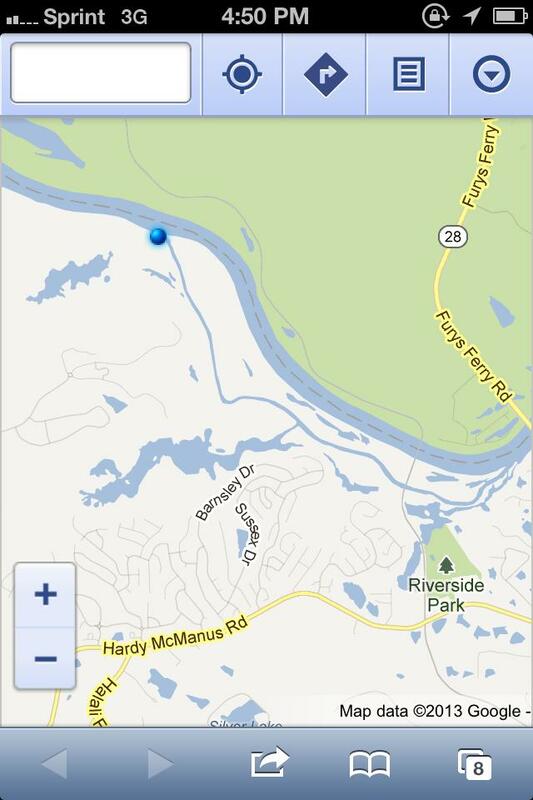 We participated in the Benderdinker, a local annual event that starts at Riverside Park, travels upstream on "Betty's Branch" (the little blue line) until it reaches the Savannah River (where the blue dot is), travels downstream on the Savannah to where Betty's Branch comes in (down by Fury's Ferry Rd), then back up the Branch to the park. There were probably 400 boats registered and I have no idea how many that just showed up and put in the water. It was raining when we headed out in the morning but had cleared up and was beautiful and sunny by the time we finished the paddle. On Monday of LAST week, Stinkerbell got out through the back door (the dogs had pushed it open) and disappeared for an entire week. I created the above info graphic and it was shared on Facebook over 220 times! This last Monday evening I was just sitting down to a lovely farewell dinner at Edgar's Grill with the ladies from my Local Helping Local group. 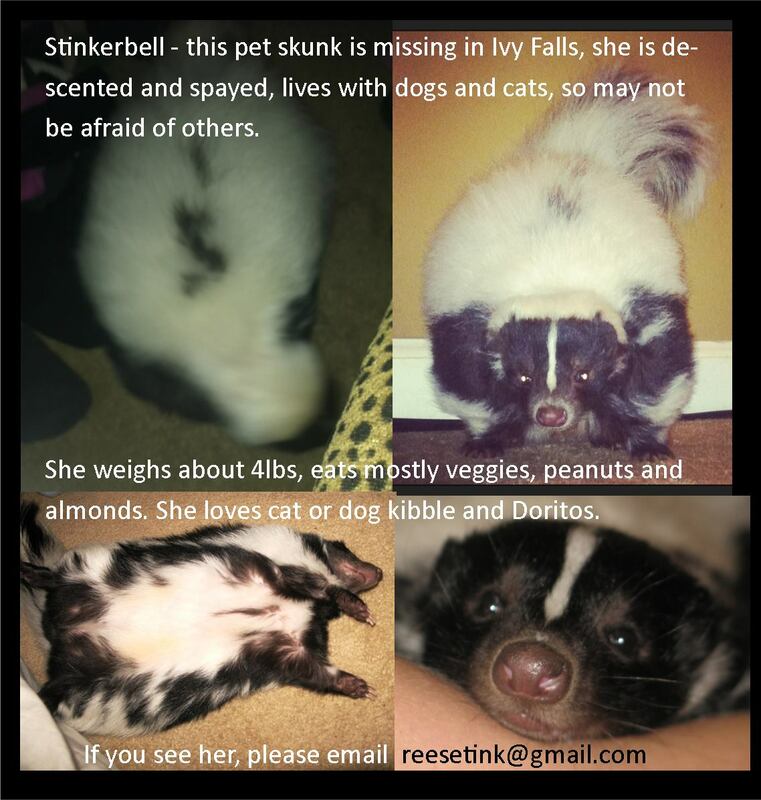 I happened to check my email on my phone and saw that I had a message from someone that had FOUND my skunk! She gave me her number and I jumped right up from the table and ran outside to call her. She confirmed that she had Stinkerbell, and told me she lives just a few houses down. I told her I would call my HusBean and send him to fetch her right away. "I am SO glad you're home with your mom, Stink! When I saw you yesterday trying to curl up in my shrubbery, I thought you just needed a moment to rest... but when the thunderstorm hit last night and you were wandering around my front yard looking upset and unsure, I just had to give you some shelter, wild or not! I hope the blanket under my car was warm enough in the garage for you, and I'm glad you ate some of the food I brought... 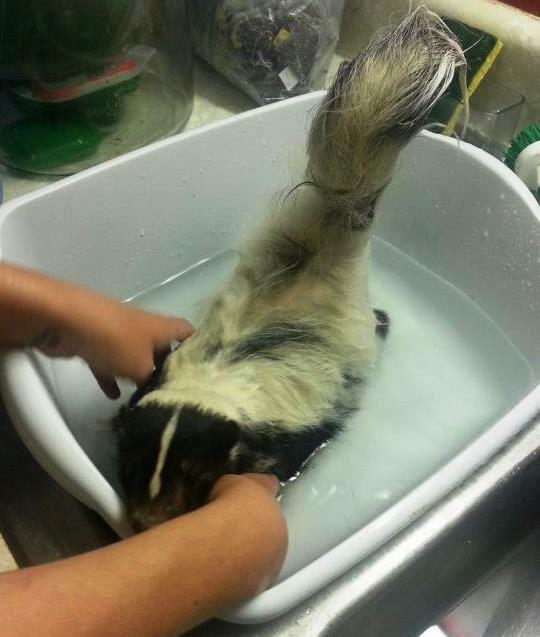 I've never fed a skunk before, and I had to do a bit of googling and rummaging through my fridge. Thank you for proving that my friend Rusty Banks can and does scream like a little girl when charged by a cute little skunk while initially helping me to usher you out of my garage (before I knew you were lost!) -- and again for being kind enough to not bite him or scratch him when he caught you back up to get out of the mud until your Dad came by to pick you up. I'm just thankful my neighbor saw your posting! Otherwise I would've tried to get you back out into the wild! Again -- I am so glad you're home and safe, and I hope to hear about you eating well and gaining some of that weight back. I hope you had a good adventure, but for your mom's sake AND her heart.... stay home!!" We got her home and started feeding her (she was quite skinny) and snuggled her up in a blanket. The next day she had a bath, which she was not particularly impressed with! Stink has been eating all her meals, and feeling frisky enough to chase The Chou (cat) and Bento (dog). I'm giving her a high-calorie supplement with her meals, hoping it will fatten her back up a bit. We are in full-blown pack mode now, I've started sorting through all of my clothes and packing them in long-term storage vs. keep at Mom's. HusBean has sorted through most of his clean clothes, we still have to tackle the rest as they come out of the dryer. I'm scheduled to pick up the moving truck on Friday morning, the 10th. Two of my girlfriends have volunteered to help that morning, they are both very hard workers and I am grateful for their assistance! HusBean is off today and tomorrow, working Saturday, off Sunday, then scheduled to work 3-11p Mon-Fri next week. I'm hoping he'll take Friday the 10th as a vacation day. Today is all about packing and laundry, hoping to sneak in a dog walk. Countdown: 2 days and ARGGGGHHHH.